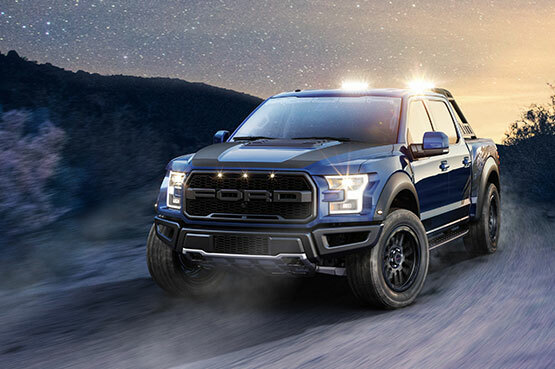 Once again, we’ve combined signature ROUSH styling with unrivaled off-road capability in the ultimate all-terrain package – the 2019 ROUSH Raptor. The 2019 ROUSH Raptor features wheel and tire upgrades along with definitive ROUSH styling cues, all designed to enhance its already formidable factory performance and menacing looks. ROUSH 20-Inch Bead Protection Off Road Wheels are wrapped in thirty-five inches of BFGoodrich All-Terrain T/A KO2 rubber to keep you firmly planted to whatever terrain dares get in your path. Exclusive color-choice, nylon-based bead protection rings help protect the wheels from off-road damage or curb rash. The high performance capabilities of the 35-inch BFG A/T KO2 tire provide the perfect balance between refined road manners and all-terrain capabilities, including locking lug nuts. A ROUSH Axle-Back Exhaust with 5” black tips leaves no doubt – in both sound and appearance - that this truck means business. The custom ROUSH gauge cluster allows you to keep close tabs on what’s happening under the hood. And the embroidered ROUSH headrest and serialized console badging never let you forget you’re piloting the best there is. The new ROUSH Chase Rack, finished in a corrosion-resistant black coating, adds a rugged take-on-the-world look. It sits above the bed; no cargo space is lost, and it’s ready for the optional ROUSH Off-Road Lighting Package. Giving you have the ability to set your ROUSH Raptor apart, the unique ROUSH graphics package includes bedside, hood, and windshield graphics. Designed in-house, all graphics are produced from high-quality, OEM-grade automotive materials. ROUSH hood and tailgate badging leave no doubt as to the distinctive ROUSH pedigree. Each badge is unique to serialized vehicles and ensures that the ROUSH Raptor cannot be counterfeited. At ROUSH Performance we deliver. We deliver passion, excitement and performance. And it all comes wrapped in unmatched refinement and heart-pounding off-road capability. From the adrenalin rush dropping the hammer on a lonely backroad to the thrill of being the first one up the dunes, don’t let them tell you otherwise; it’s all about the excitement. Precision ROUSH craftsmanship goes into each and every truck we sell. Our vehicles are engineered to demanding standards and thoroughly tested – in the lab, on the road, and off the beaten path – to ensure a long and reliable life. But there’s more. We’re proud of the fact that we’re in this together and to that end we’ve gone the extra mile, standing behind the 2019 ROUSH Raptor with an industry-leading, 3-year/36,000-mile limited warranty.